Paradoxically enough, I spent last Friday night, the first night of Hanukkah 2009, decorating Christmas cookies with Phoebe at Kate’s house, in preparation for the following night’s holiday party. In between icing a stocking and a candy cane, we lit the first two candles. I spent Saturday, the first day of Hanukkah, with my family at Uncle Michael and Aunt Cindy’s house in Westchester. My sister Jill picked me, and a container of wings (anything deep-fried goes! ), up at the subway, and we drove together. When we walked into their house, the first thing that grabbed me was the scent of latkes, which Uncle Michael was warming up in the oven. The next thing that grabbed me was my mom. “There’s no dessert!” she told me. “Would you rather drive back out and get something, or want to make something here?” The fact that I can’t navigate White Plains by car had nothing on the fact that I’m always in the mood to bake. Duh. Fortunately, Uncle Michael has a very well equipped pantry and probably the best set of kitchen gadgets I’ve ever laid eyes on. He set me up with everything I’d need to make one of the few recipes I could genuinely bake up while asleep: classic chocolate chip cookies–or “twenty-minute cookies” as my mom was calling them. The reason they had to be done so fast was because we wouldn’t start opening gifts until they were in the oven. So to prevent a riot, I pressed the dough I’d just pulled together into a baking pan; rolling out balls would have taken far longer. I did have help: mom took a turn chopping the chocolate, and Uncle Michael cleaned up after me. The timer beeped just about when we were finishing the gift-giving and heading towards the spread of bagels and salmon. By the time we were finished eating, the huge rectangle of cookie was cool enough to cut. And then when we were ready for dessert, we were happy to find the cookie-bars were still warm. Everyone went for them, having, of course, saved room since their scent was even more pervasive than the latkes’. Uncle Brad goes for one. Jordyn looks on with crazy eyes. Now, skip to Sunday. Saturday’s Christmas party was fun and also exhausting, and Sunday was a relaxing, rainy day. Around noon, Alex told me that he had a surprise challenge for me for dinner. He was going to bring an ingredient over, and I was going to incorporate it into the meal. Why not? I figured. It was much too gloomy to to go outside, and while I was waiting to find out what on earth he’d bring (I got it out of him that it was a protein), I started going through the contents of my fridge, shelves, and pantry. I settled on the potates and got to thinking again about latkes. It goes without saying that making potato pancakes is a bit of a pain, and that, if it’s possible, you should be an eater of them and not a fryer–as I had been the day before. That said, after a lazy Sunday, making 8 or 10 latkes to serve only two didn’t sound all that daunting. Alex arrived with four beautiful filets of flounder, and my mind, already on frying, couldn’t help but want to bread them. 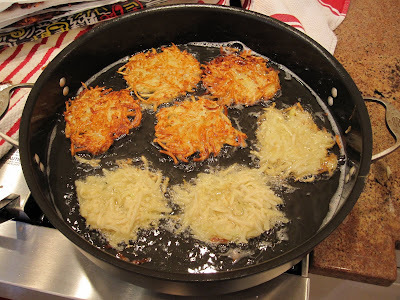 The problem is that I have only one good-sized skillet, and if I were frying latkes, I wouldn’t be able to fry fish. I decided, then, to bake the flounder, racking my brain for how best to eat hot latkes without overcooking the fish. There was more to do, too: I didn’t have any applesauce, but I did have apples, so I made an impromptu sauce, peeling and coring the apples before cooking, since I don’t have a mouli. I sliced and roasted a zucchini. And, fearing the fish would be dry without a sauce, I made a quick homemade mayo and mixed it with some parsley pesto I had made with a bunch of leftover parsley the week before. With Alex’s help grating the potatoes, I swear, it took me less time to do all this than to make the cookies the day before. Make 1 recipe of this milk chocolate-dark chocolate cookie dough. Press the dough as evenly as possible into an ungreased 9×13″ pan. Bake for 25 minutes until the top is just firm and the edges are barely golden. Cool in the pan for 10 minutes, then gently remove it and cut into rectangles, diamonds, or squares. Grate the potatoes and the onion into a mixing bowl. They will oxidize and brown quite quickly–don’t worry too much, but do work fast if possible. Add the salt and the egg, then stir in the flour. If the batter still seems too liquid, add another tablespoon or so of flour. Heat about a 1/2 inch of oil in a large, cast-iron skillet. Add a few shreds of potato; when they start sizzling, you can start making pancakes. Peel, core, and roughly chop the apples. Put them in a small saucepan with about 1/4 cup of water and the sugar. Bring to a boil, then cover, turn heat to low, and simmer for 10-15 minutes, until the apples have disintegrated. Mash any remaining large pieces, then taste and add any extra sugar to taste. Preheat the oven to 400°F. Spray or brush a roasting pan with olive oil. Toast the bread lightly and tear it into rough pieces. Pulse in a food processor to make breadcrumbs–it’s fine if they’re uneven. Toss the crumbs with the red pepper, oregano, thyme, and salt. Arrange on a shallow plate. In another shallow plate, beat the egg. Add another small pinch of salt and a grind or two of fresh pepper. Put one filet in the egg, turning to coat both sides. Move to the plate of breadcrumbs, again turning to coat both sides, and using your hand to press in any extra crumbs. Transfer to the baking dish. Repeat with the remaining filets. Coat them with another spray of olive oil. Cook for 6-10 minutes, until the breadcrumbs are slightly crisp and the fish flakes when you insert an knife into it–it should be completely translucent. Serve with tarter sauce or homemade herbed mayo. I used a parsley pesto I happened to have, but truthfully–delicious as it was–it’s too involved to start from scratch for a relatively easy dinner. As it turns out, the flounder is not at all dry and is thus quite good on its own. The flounder sounds delicious, and like a lighter version of the normally fried version. And, I'm sad to have missed out on more (forced) family fun, the pictures look stunning and yummy, as always. Your pictures are so cute! I swear, these latkes in blogland are making me crave them SOOO BADLY, especially when they are the best looking latkes everrrr! Oh the latkes were yummy.